Today I share with you another sneak peek of some new product in the Annual Catalogue which starts 2 June! This stamp set I use today is the Ronald McDonald House Charities set for this year. Stampin’ Up! donates time and money to support RMHC. To date, we’ve contributed over $1,000,000 to RMHC and their network of local RMHC Chapters. RMHC keeps families together and surrounded by love when their children are receiving medical treatment far from home. Buy the Sprinkles of Life Stamp Set and Stampin’ Up! will donate $3 from every sale to RMHC. But the bonus is that there is a coordinating punch! Who doesn’t love ice-cream, right?!!! It is certainly a special treat in our house and my kids love this card I am about to share with you today. This stamp set is photopolymer, so it is completely clear so you can stamp exactly where you want it to be! Love, love, love my photopolymer stamps!!! The base card is Pool Party with a layer of Strawberry Slush, then a layer of Watercolour paper. 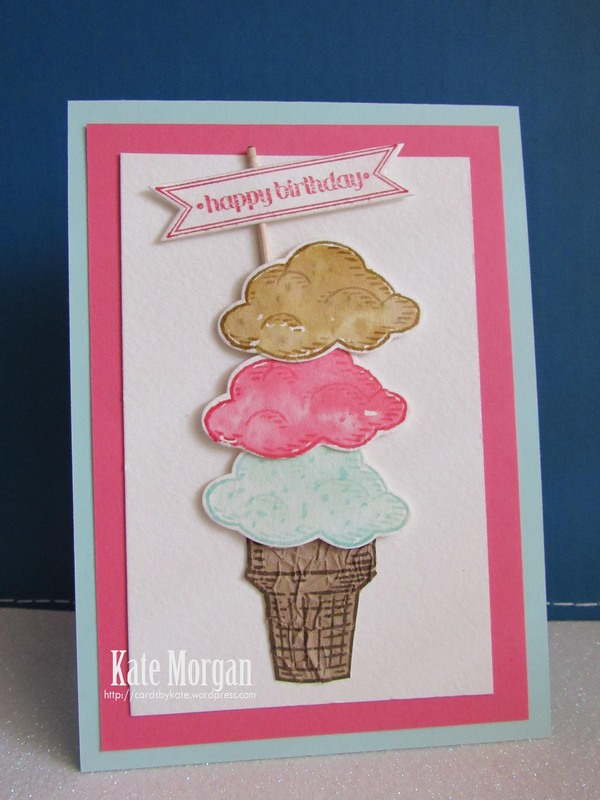 I stamped the ice-cream scoops onto Watercolour paper in the above inks and used my Aqua-painters to water colour the centres. I used the coordinating Tree Builder Punch to cut them out. 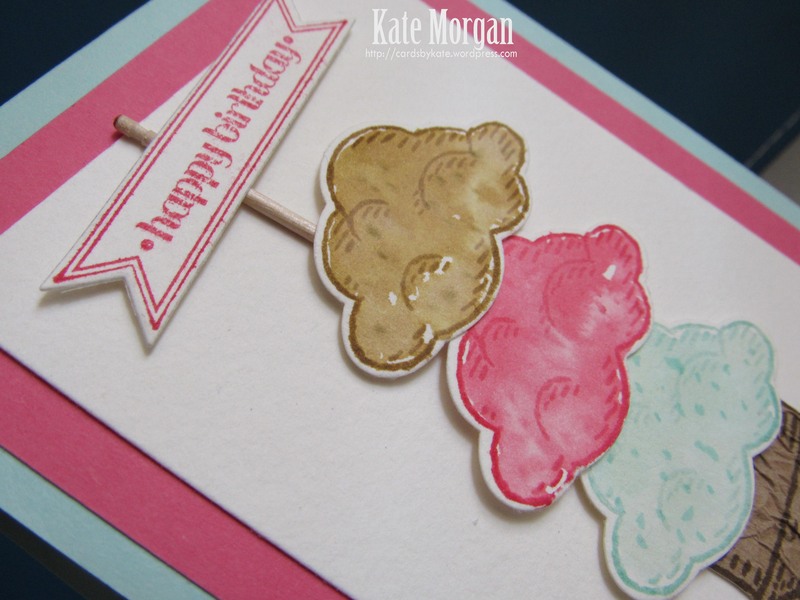 This makes cardmaking so easy! Now, you know when your order of Stampin’ Up! goodies arrives at your door in a Big Brown Box and all that extra brown paper, well….. that brown paper does come in handy some times! Check out the cone – I scrunched up some of that brown paper and then flattened it slightly and put it on some card that has lots of rows of Fast Fuse on it. It sticks really well. Then I stamp the cone image and cut it out! I added the ice-cream scoops and the happy birthday banner with dimensionals. The small pole is just a toothpick! I absolutely love this set and know that you will too, especially once I share some other projects over the next few months as I am sure to make plenty with this set! Don’t forget that the Retired Product List is still available so click here to shop online 24/7! I also want to remind you that the end date for the 2014-2015 annual catalogue has changed from 30 June to 2 June! So be prepared for this change and get those orders in before the items run out.